Another one to throw in the mix - the Fabarm L4S. I got mine new for £750 with a nice case, 5 chokes, spacers etc. 5 year warranty and backed up by Anglo Italian Arms who have probably the best customer service in the business. You get a half decent piece of wood and it's light and soft shooting. It's been faultless. I think Fabarms are very underrated my son has a 3 inch semi from the late 90s and its light low recoil reliable handles great they never seem to have got their uk marketing quite right. 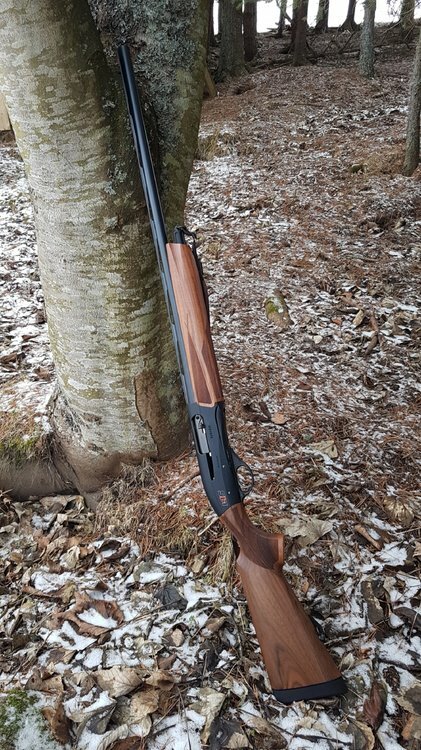 some other italian makes are better marketed here. .
Had Hatsan escorts for years put thousands of cartridges through them and had very few problems, just got a Beretta 303 and finding it difficult to get yoused to. The trigger is very light and the loading mechanism complicated, not as nice to fire as the Hatsan. But the main problem is the safety catch is in front of the trigger and difficult to push of. Just out of interest and this is in no way meant sarcastically but what exactly are you finding complicated about the loading process? I didn't think one in the chamber and 2 through the bottom was uncommon or particularly complicated? I've used a friends 303 Beretta and it loads the same way as any other auto I've owned ( the Browning 2000 side loading gate being the only exception ) plus what is the problem with the safety? If it's an issue don't use it. The hatsan is easy to eject unused cartridges just pull the bolt back 3 times and its done, the beretta only ejects one and doe's not reload may be its just me and will get yoused to it. Ah...see what you mean. I thought you said ‘loading’. It’s been a while but I think it’s designed like that so your unused live cartridges aren’t ejected into the grass/puddle/carp or whatever.